Zidgel: How many penguins does it take to change a light bulb? Kevin: Four. And one little girl. Runaway Pride at Lightstation Kilowatt is the third episode in the 3-2-1 Penguins! series; written and computer-animated by the folks at Big Idea, creators of VeggieTales. Once again, arguing siblings Michele and Jason are stuck at Grandma's house while their parents are on vacation. Whenever they get themselves into a troubling ethical dilemma, or start to exhibit snooty, typical kid behavior, they get sucked into a model spaceship that is piloted by a crew of friendly space penguins who then zoom them off to a distant galaxy where they can have an adventure (with moral implications!). This time around, Michele is the offending party. Jason finds a finger-painting set and the two start to work. Michele is without her glasses, but that doesn't stop her from bragging to her brother about her amazing artistic skills. He quickly gets fed up with her attitude and leaves, and as she admires her handiwork, the penguins' ship comes to life and shrinks her down. The crew informs her that the beacon at Lightstation Kilowatt is burned out, and that ships will crash if it isn't repaired. Captain Zidgel and the dimwitted Kevin are sent down to do the dirty work, while the others try to warn the approaching cargo ship. But Zidgel, convinced he knows what he is doing, quickly breaks the equipment and makes things worse. Will Michele step in just in time to quote Grandma's Bible verse of the day and save them all? Did you see volumes one through three? I often preface my reviews by making comments like, "It's a Christian show, but not too Christian." I realized watching this disc that that isn't entirely accurate. Though the moral lessons are universal (pride cometh before a fall, in this case), the methods by which they are communicated is fairly Christian. I'm not saying the series is evangelical, but if you are of a different religious persuasion, or if Bible-thumping (though this is more Bible-nudging) turns you off, you should probably skip these releases. 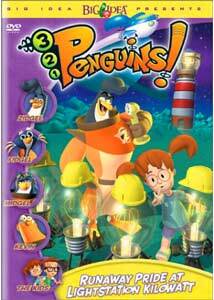 On the other hand, if you like VeggieTales, or if you've seen previous volumes of 3-2-1 Penguins!, this is the disc for you, because I think this might just be the best episode yet. The lesson is simple, and fairly subtly communicated, and the oddball humor that makes the show just as enjoyable for adults as kids is here in abundance. The interaction between Michele and Jason is very natural, and a perfect picture of the way kids treat each other (well, they are nicer and they do forgive awfully quickly), and the penguins personality quirks grow more memorable with each release. And the little light bulb inhabitants of Lightstation Kilowatt rival in cuteness the adorable vacuum guys from Trouble on Planet-Wait-Your-Turn. I'm continually amazed at the quality of animation that comes out of Big Idea Productions (particularly when I compare it to their early VeggieTales videos). They are quickly approaching the level of, say, early Pixar (and they have vastly smaller budgets). The character designs and renderings are nice enough, but it's the backgrounds that really impress. The Lightstation is surrounded by an ocean of energy waves that looks like something out of the latest Star Trek movie. The feature cartoon is a little shorter this time, but it is followed by a funny animated song short in the vein of The Beach Boys. The song is called Space-Surfin' Superstar, and is preceded by another cute bit of "binary humor" from the robot ventriloquist. Image Transfer Review: Not a lot to say about this one, except that it looks wonderful. Colors are rich and saturated, with nice solid blacks. Compression artifacts aren't a problem, nor is edge enhancement. It's easy for CGI to look good on DVD, but this show looks exceptional. Audio Transfer Review: The 5.1 English mix adds a bit of pep to the show (which also sounds fine on an included 2.0 track). Dialogue is anchored in the center channel and clear, with the front mains spreading out the score and sound effects with good directionality. The surrounds seem to be much more active than in past volumes, and there are some nice front to back pans as the ship flies overhead. Extras Review: This is the fourth disc in the 3-2-1 Penguins! series, and it serves up another pleasant array of extras aimed at both kids and adults. There's no in-character commentary this time, but the rest of the package is very similar to what we've seen on previous releases. Under the menu selection Behind the Scenes, is some production information. Two "How to Draw" featurettes, each running a little over two minutes, teach you to draw Kevin and Michele. A Progression Reel offers a storyboard-to-screen animation comparison via the angle button. The Concept Art gallery offers a peek at some early incarnations of several different characters. Selecting Penguin's World takes you to another page of features. The 3-2-1 Bios! are identical to the ones that appeared on the other Penguins! discs. Space Academy School (Course 401) teaches you how to talk to aliens (hint: Pig Latin). Hey Kids! houses most of the extras. The gallery of interactive games is very similar to those on the previous disc in the series. Space Maze! and Hide & Seek are both fairly simple�kids should have no problem playing them using the remote control. A set of 10 episode-specific trivia questions, when answered correctly, will net you some bonus footage about real world penguins. There's a karaoke version of the song Space-Surfin' Superstar and an interactive storybook version of the feature episode. This time around, the Recipe from Space is for Jellied Eel Donuts, aka pastries filled with purple goo. Video instructions are provided for a Family Fun Activity that reinforces the episode's lesson about asking for help when you need it. A promotional gallery features spots for other Big Idea releases, including Jonah: Sing-A-Long Songs, Jonah: A VeggieTales Movie, VeggieTales: The Star of Christmas, LarryBoy and the Angry Eyebrows, LarryBoy: Leggo My Ego, 3-2-1 Penguins! : Trouble on Planet-Wait-Your-Turn, 3-2-1 Penguins! : The Cheating Scales of Bullamanka, and 3-2-1 Penguins! The Amazing Carnival of Complaining. And on the DVD-ROM side, we've got a coloring book that can be printed out, as well as the complete script (in rich-text format). The lengthily titled Runaway Pride at Lightstation Kilowatt is another fun entry in the 3-2-1 Penguins! series. If you are looking for children's entertainment with a moral message, you can't go wrong with Big Idea's releases. Plus, they're just as entertaining for adults.